We love hearing what our customers say about us! Working with Soulful sounds was wonderful. They were punctual, easy going, and most importantly, able to read the crowd and kept the party going. Even though the ceremony, cocktail hour, and reception were held at 3 different parts of one venue, Soulful sounds was able to accommodate us accordingly. All of our guests loved the music. We even had a few people come up to us requesting their contact information (including our photographer). Overall Soulful Sounds was awesome and we would wholeheartedly recommend them. Soulful sounds was amazing. I could not be happier with the service. They had the party going all night. Jeff listened to our request and was the perfect mix of engaging and letting things flow all night. By the end of the reception he knew many of our guest by name. I highly recommend soulful sounds. They were an absolute pleasure to work with. If you’re reading this review look no further. Book them they are the best. 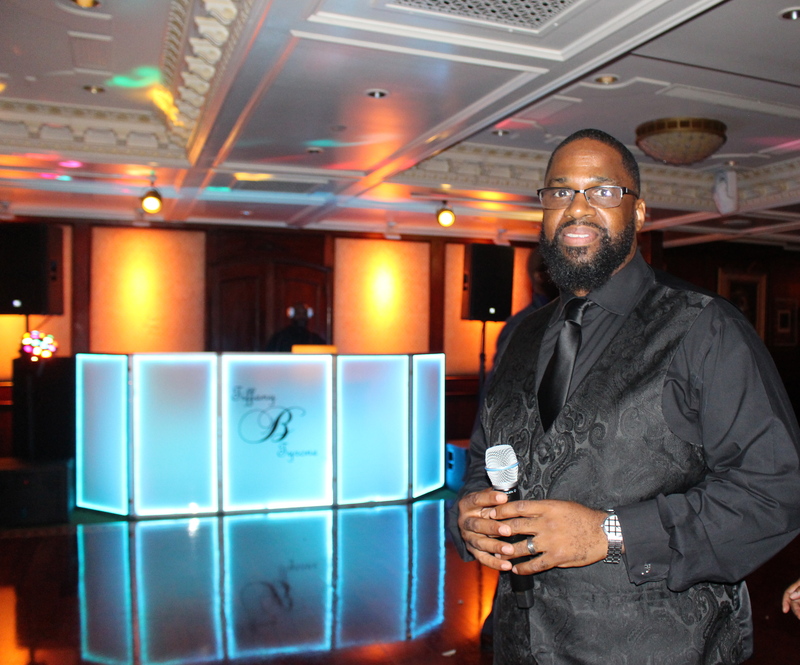 Jeff and the Soulful Sounds team are amazing, we spoke the week of the wedding to discuss some music changes and the vibe of the dance floor. Jeff understood my vision and interpreted even when I wasn’t quite sure how to bridge exactly what I wanted. During the ceremony, we had three song changes and everything went seamlessly. At the dinner, Jeff served as host and guided my guest through dinner and speeches, effortlessly. He was able to play music at the reception that had my family and friends of all generations on the dance floor and he did it with he utmost professionalism and charm. Our guests were given party favors and were extremely pleased that they were able to sweat it out after a romantic ceremony. If you’re looking for a D.J. services for your wedding or event Soulful Sounds are the best! Soulful Sounds provides professional and exceptional service. Our DJ, Osei, was very attentive and he also rocked the house! We couldn’t have asked for a better DJ. Thanks Soulful Sounds! I cannot say enough wonderful things about Jeff and his team! Hands down the best. The music was always where it needed to be. His team was great to work with, true professionals. Everyone loved the music, the cool floor display and the non stop display of photos! His MC skills kept the whole day running smooth and kept the dance floor packed. We were truly blessed to have Soulful Sounds at our wedding! Thank you again and see you at our next event! Soulful Sounds were very professional from start to finish. They were able to work with my budget. All the last minute changes I had , they were able to accommodate. They kept my guests moving the entire night. Soulful Sounds is great at what they do. They got the party started at my wedding right away. Everyone was on the dance floor all night. My husband, family, and I highly recommend them. My husband’s family used them multiple times and they always gave everyone a great night. Jeff and his team worked with us closely and made sure they incorporated music we wanted and everything else we asked of them. If you want to have an amazing night, I would use them. They will make it one to remember! Anthony and I would like to send our most heartfelt appreciation to you and your team for the wonderful evening that you put on at our wedding. Your performance and professionalism was fantastic. You truly brought people to the dance floor and kept the night going. The compliments on the wonderful music at our wedding far exceed what one could imagine and we owe that all to you! No one wanted the evening to end, including us. You absolutely made our dream wedding become a reality. Our wedding night was the most magical and memorable night of our lives and having you as our DJ and MC made it all that more perfect. Not only did we get a fantastic DJ and MC, but we were also blessed with one heck of a wedding coordinator. Thank you for everything you did to make our wedding perfect, hopefully we will have the opportunity to use you again in the future. I just wanted to thank you again for everything, everything was absolutely WONDERFUL, everybody had so much fun. I received so many compliments about you…everyone LOVED you, the DJ and the steel pan…I just wanted to let you know, that everything you guys did was out of this world. I really hope that Leslie and I can use you in the near future for an event. I told Les, that I want to use you guys for our children’s 1st birthday and “ALL” other special events!! Thank you so much for your DJ and MC services on my wedding day! Soulful Sounds was absolutely fantastic!! You did such a wonderful job as MC. Everyone had a great time! You helped make to my day even more special and memorable. Thank you so much! We want to take this time to thank you SO much for an absolute awesome time at our wedding. Chris was the BEST! Everyone complimented on his ability to get the crowd moving! We appreciate everything you did to make our night a night to remember! Thank you guys so much for doing our wedding. You gentlemen did an amazing job with the music selection. It was exactly what we were looking for. Also your ability to organize all the many presentations we needed was extremely helpful. You really helped make our wedding a special day to remember. Ashley and I are back form the honeymoon and still buzzing with how great the wedding was. Your work was a huge part of our happiness. When you played Seven Nation Army, Stand By Me, New York State of Mind…they were all magical moments. Thank you for your great music. We won’t hesitate to have you spin again for us or recommend you to others.See you soon! Jeff you are simply the best!!! Our friends and family had a great time. Even though we ran behind schedule, you kept them on the dance floor the entire time. Thank you, thank you thank you !! We will defintely be reaching out to you again. Thank you so much for an amazing DJ set at our wedding. We have had so many friends and family say the DJ & MC were so great! You both did an out standing job & we loved every moment. I would like to apologize for undermining you. I asked if you had the 3 songs because I had them on CD just in case, and you did! I asked about my niece’s solo spot on the wedding agenda and you had already met her and put her on your schedule.